A pictorial story, the making of Valkyrie 7. 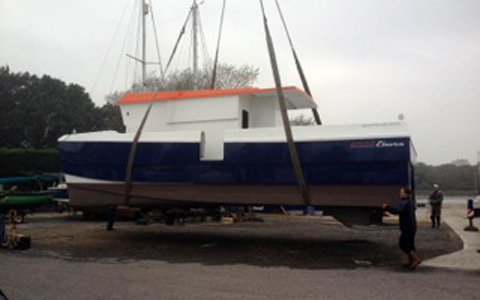 They say picture paints a thousand words, so we hope you enjoy some images of the creation of Valkyrie 7 for the new 2013 Season. 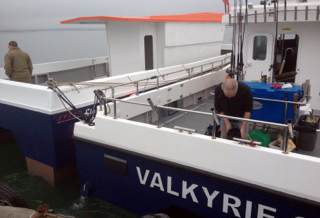 We took Delivery in October 2012, we were ready to launch April 2013 and Valkyrie was coded by the MCA as CAT 60 mile. This is the bare set of mouldings being put ashore ready for the fit out. It's important at this stage to have the boat level with a slight run aft to allow any water to escape. As I will be building the boat out side, the fist job is to cover her up with a couple of big tarps. A peek inside of one of the fuel tanks, the tanks worked out to be 375 ltrs each. The lids go on and placed in the tank room ready for the pipe work. The dash to me is one part of the build that has to be easy to use, everything with in easy reach and very usable. Here are a few shots of the process involved in building the dash. The finished dash is very easy to keep clean. Always an exciting time when the engines turn up. Although time consuming, putting the engines in is a process I enjoy and one that's very rewarding when hopefully everything runs smoothly. More images taken during the Build. 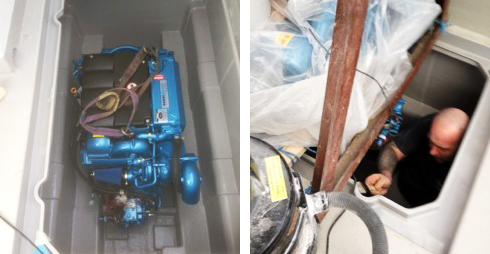 Images of the Cabin and electrical fittings. All Done and ready for the 2013 Season. If you have a question please use the contact us form and we'll get back to you as soon as posible.